Give Your Worship & Sound Team A Makeover! Does your worship sound as good as you want it to? Does your congreation hear all of the singers and musicians clearly? Does your worship team perform to it's full potential? With a Worship Makeover Workshop, your singers will receive vocal coaching from internationally acclaimed singer Tara Mathew and your sound team will get training from Tara's production company (Media Ministries) Director, Kevin Wilson who has over 20 years of professional sound engineering, recording and music production experience behind him. Pictures of studios owned by Kevin Wilson and from one of the many festivals he has organised. Not only did Tara graduated with a B.Mus from one of Canada's leading Universities of Music, but she did so with the highest mark awarded for operatic vocals in 40 years. During her career, she has performed on television, radio and at major festivals around the world singing to literally millions of people. Although majoring in Opera, Tara sings and coaches in all types of music and will work with your singers to suit their style of worship. What Is A Worship Makeover Workshop? Typically a Worship Makeover Workshop would take place over a weekend and would consist of the singers spending the first part of a Saturday with Tara, whilst the sound team and band would be with Kevin. 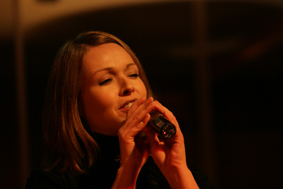 During the workshop, Tara will give personal coaching to your singers on how to prepare, rehearse and perform to the best of their ability, which will increase the overall worship experience of your services. And whilst the singers are being coached, the sound team will undergo training on basic (or whatever level is required) sound engineering, simple maintenance, use of equipment amd correct equipment wiring. Avoiding hum loops (that cause buzzing), feedback and other annoying problems will also be covered, along with the correct way to mic up the performers and carry out a sound check before a performance. Following this the whole team will join to bring their new skills together and prepare for the service the following day, which will be overseen by both Tara and Kevin. During the Sunday service Tara will also perform and share her very powerful and inspiring testimony. For further details please contact us using the form below! Do you want information on any of our other services?